A clap of thunder tore through the still air quickly followed by the irregular, staccato beat of a dozen heavy raindrops clattering against the thin, tin roof of the climbers’ shelter. Seconds later, the clouds unleashed an assault of such ferocity that it threatened to distort the smooth undulations of the corrugated roof into a dimpled finish. At this point, we had not even passed through the gate into Kilimanjaro National Park, but already the mountain was squaring up to us. Its casual show of power sent a flutter of tension rippling through my belly as I quietly weighed up the brutal scale of the climb. From the small town of Moshi, where climbers ordinarily gather before tackling the mountain, Kilimanjaro is a picturesque backdrop; a tourist icon that towers over the town, its summit glaciers defying the African sun. It adorns postcards, paintings and t-shirts. 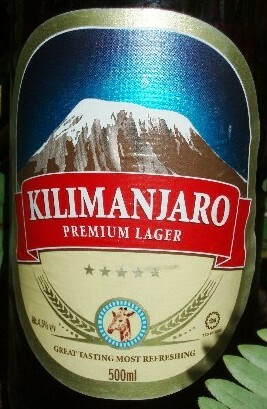 If you can’t climb it you can drink it, since it has given its name to brands of both bottled water and beer. By day, it often slips demurely beneath a veil of altostratus, or broods behind towering walls of cumulonimbus. But at dusk, Kilimanjaro often abandons modesty and reclines in majestic glory above the town. As the first stars pierce shining holes in the velvet blue-black expanse of the sky, tourists sip sundowners on rooftop terraces and watch as her glaciers catch the sun’s fiery afterglow. This image of peaceful, picture-postcard perfection is at odds with the mountain’s scale and might. Those ornamental glaciers dwell in an atmospheric stratum far removed from the equatorial warmth of Moshi. The summit, a mere 25 kilometres from the town, is also distanced by some five thousand vertical metres. That is considerably more than the elevation rise between the base camp and summit of Everest. 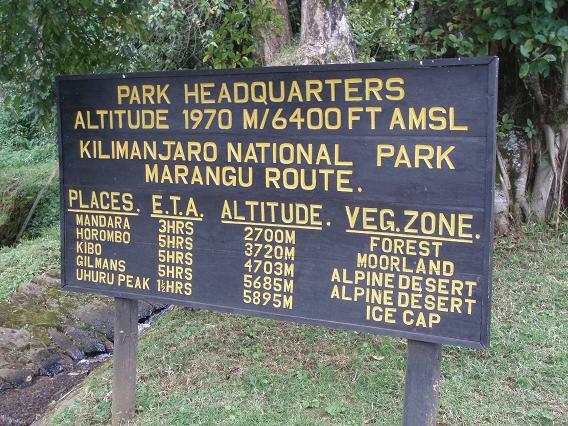 But let’s keep things in perspective: Kilimanjaro’s summit is only slightly higher than Everest’s base camp and the climbers’ shelter at the park gate, where I was eating the last of my lunch, is not even 2000 metres above sea level. By the time my permit had been processed and I was ready to start hiking, the storm had passed. Beyond the park gate, the trail climbed gently through tropical rainforest. The trees were still dripping and the smell of damp earth swelled through the undergrowth. Just out of sight, a swollen river surged downhill, splish-splashing over rocks. Suddenly the sound of rain pitter-pattering on the upper canopy prompted me to pause and glance skyward, wondering if the approaching shower merited donning a rain jacket. But the sky had cleared and there was no threat of rain; it was just the dripping foliage and gushing river deceiving me. Although the afternoon sun now beat fiercely on the high canopy, the trail gently wound its way upwards through the cool, dense shade of the semi-tropical forest, twisting between the powerful trunks of cedar, juniper and wild olive trees. 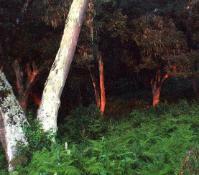 The lower limbs, festooned with lianas and lichens, are home to an abundance of animal and bird life. Most species are reclusive but birdsong chirps across the trail and you may hear the territorial calls of colubus monkeys in the distance. The trail ahead became brighter and suddenly I emerged from the shade of the forest into a narrow glade; I had reached Mandara huts, the first night’s accommodation. Set in a clearing a couple of kilometres below the tree line, Mandara’s allure is cosy seclusion. There are no sweeping mountain vistas because the huts are enclosed within walls of dense, green foliage. The gnarled and twisted branches evoke images of elves and talking trees; hanging vines are ready to entangle and ensnare trespassers; and great beards of lichen ripple in the breeze. I unfurled my sleeping bag on one of the bunks then strolled around the clearing, enjoying the feeling of walking on air that comes after shedding a heavy pack. The view horizontally stretched barely a dozen paces in any direction but glancing upwards after dark offered a view that stretched to infinity. The storm clouds had long since dispersed and now, surrounded by the absolute darkness of the forest, a twinkling pageant of constellations sparkled brightly. Greek legends sprang to life in a tapestry of love, rivalry and war; and the innumerable stars of the Milky Way really did look like a swash of milk spilt across the sky. Deep, cool draughts of night air filled my lungs as I searched out the familiar outline of Orion and tried to locate the Southern Cross. I was spellbound by the glorious perpetuity of the heavens but the clear sky sent the temperature plummeting and I was soon scurrying for the warmth of my sleeping bag. My eyelids had an exertion induced heaviness that quickly tumbled me into a deep sleep but as I drifted off I decided that Kilimanjaro’s bark was worse than its bite; the mountain’s thunderous threats that morning had just been so much empty rhetoric. If you are enjoying reading, please share this page with your friends and followers. Kilimanjaro's summit glaciers catch the sunset afterglow and below, the dense tangle of tropical rainforest on Kilimanjaro's lower slopes. A brand as well as a mountain; altitude sickness is not the only cause of headaches for those who choose to "Do Kili" and, right, the golden light of the setting sun pierces the gloom of the Mandara forest casting an ethereal, almost phosphorescent glow over the lichen laden trunks. All images © Jon Bigg; all rights reserved. Years ago the first edition of this Lonely Planet title just leapt off the bookshop display: Africa and mountains - the sleeve just conjured up so many exotic possibilities that I had to own it. Kilimanjaro National Park MapForget T-shirts; for me it's "Been there, got the map." I can relive a holiday or climb, or go on a brand new fanciful adventure, just by poring over a map. This one includes useful street layouts for Moshi and Arusha, and is <?<st1:stockticker>GPS approved, whatever that may mean! Portable, pocket-size and cheap, but packed full of useful phrases. Swahili is an uncomplicated language and Tanzanians are patient with beginners. Believe me, a few Swahili words go a long way. Marangu Park HQ, gateway to Kilimanjaro. All Backpacker Diaries content © Jon Bigg (except where otherwise stated). If you wish to use any material published on this site, please contact Backpacker Diaries .